Epicurus’s Vatican Saying #74 runs: “the one who loses in a philosophical dispute gains more the more he learns.” I remember reading that line as an undergraduate, thinking it curious and perhaps a bit perverse. How would Epicurus himself apply this to his own views, after critique from the likes of Stoic, Skeptic, or Christian critique? It sounds more like the kind of advice one gives, but rarely takes. The college sophomore version of me, I think, was on to something, but in sophomore fashion, I missed something important, too. There is, on the one hand, a deep insight behind Epicurus’ point, and it is one that lies at the heart of what we are trying to do when we argue with each other. And there’s a practically useful turn the view has, too, in helping keep the heat down in significant disagreements. But on the other hand, there’s a problem with the vision of argument, especially when bearing on significant disagreements. It seems the more we need Epicurus’s advice, the less likely we can take it. Let’s start with Epicurus’ insight – if you’ve lost an argument, that means your opponent said something (gave an argument, produced a counter-example, made an objection) you had no response to. Generally, the argument game is played, like chess, until one side has no more (legal) moves. The side making the last legal move wins, the other loses. Assuming the reasons that pass inspection in the exchange are ones that improve our cognitive position with regard to an issue, the views and reasons for them endorsed after the argument (assuming they’ve been revised in light of the reasons exchanged) are better than those before. So, if your views don’t survive the critical scrutiny of an exchange, you’ve learned something. At least that what you’d originally believed was at best poorly supported, or at worst just false. Further, you could learn that some new view is true, or perhaps just better supported than the competitors. You leave the exchange with new views, and new views about views. That’s not nothing. One nice upshot of taking this point to heart as an arguer is that it promises to mitigate the sting of argumentative loss. In fact, the promise is that it turns losses into gains. And the threat of losses, too. So, after an argumentative loss, we’re supposed to say something like: Yes, I was wrong, but now I don’t make that mistake! See how far I’ve come?! For sure, this is a kind of secondary virtue – being able to admit mistakes and learn from them. Yes, that’s good. But the primary virtue is in not making mistakes in the first place, being the one who can correct those who make the mistake. Not in being the one who needs and must accept the correction. Yes, it’s good to exercise that virtue of learning from mistakes, but it’s better not to have to. It is with this last thought that I find myself pausing. The analogy of winning strategies with chess goes only so deep when it comes to arguments, and one reason is simply that it matters little to anyone before the chess match which color wins. It is only after the colors have been assigned does anyone care. Not so with argument – we choose our sides and set up our boards well before argument games with others commence. Moreover, we generally argue with others over matters that, well, matter. So, here’s the problem. Generally, if you’re arguing with someone over something, the issue matters. And it matters to you that you’re right and that you defend that view that’s right. We argue to win, at least in the sense that a good arguer will find ways to defend her view against objections, make as minimal a change to the view as is required, and produce counter-arguments against competitors. That’s how you argue well (and back to the analogy with chess – you check mate the other king, not your own). So arguing well means that you’ve got a side, one you’re interested in, and not just for the sake of the argument, but you’ve invested in it because you think it’s true. Often, with these commitments, we live in light of them, we make plans, we see our lives as meaningful on their basis. A lot hangs on many of these things. So when you lose an argument, and especially one about values or general conceptions of what human life should look like, there’s another sense that you haven’t just failed to win an exchange, you let yourself and the life you’ve invested in down. You are often in these arguments to defend yourself. The truths we live in light of aren’t just things that we can bear disinterested interest toward once we’ve accepted them in. We’ve cast our lot, we’ve joined a team. It’s part of who we are. So, surely, it’s a problem for apologists when they are bested by skeptics, and the same goes for defenders of views when faced with counter-evidence. Argumentative losses aren’t just losses at a game, but they are cases where we’ve failed our truths. It just feels bad. And the only lesson we can see ourselves learning isn’t about the truths and alternatives, but rather it’s a lesson about how we aren’t worthy of the views we adhere to. It’s not hard to think that thought – after losing an argument, you don’t change your views, but rather you are hard on yourself for being a bad representative of the views. This is a consequence of our investment in our views, and that’s ironically the whole reason why we need argument. 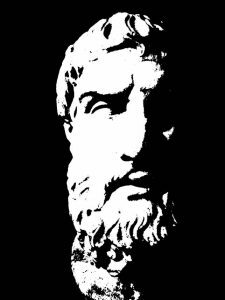 Epicurus’s philosophical program was one committed to promoting comity between people and placidity of mind for individuals. In short, Epicurus was hoping to help us find a way to relax. So, a piece of advice accentuating the positive in an argumentative loss is certainly in the spirit of his ethical vision. The strategy can work only if we can see it on the right track. And, for sure, there’s a sense that it is and we can see it. But the advice requires that we see ourselves as learning something substantive as a result of the loss. And any good piece of advice must not only be good, but it must be advice we can take and follow. And the problem with Epicurus’s advice is that those who need it most are those who are least able to follow it.